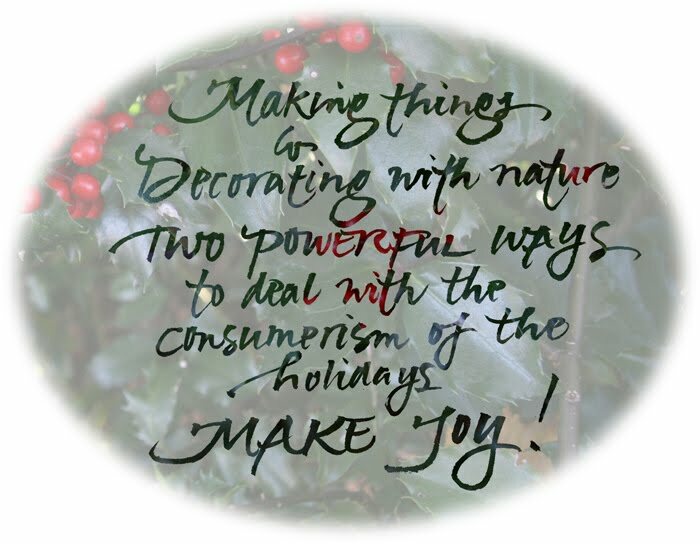 In my last post on the oak leaves, I wrote:"Making things and decorating with nature are two powerful ways to deal with the consumerism of the holidays." Kate said she liked it so much she was going to write it on a poster for her house and library. I decided to write it out as well and added: Make joy! I love this and it is so true. I wish that you had a follower button so that I could follow you and have you listed on my profile page as someone I follow. That way others would see you and also I would REMEMBER to check for your address. I love your work and words. Thanks so much for your kind words. I have added a subscribe button to the blog, just above news of upcoming exhibits, etc. Thanks for the push. This new world is full of learning. This is so great - not only for Christmas, but for every day consumerism as well!